It’s the weekend, you are heading out for the night to your friends birthday party. You look in the wardrobe and pull out you favourite pair of jeans. Pulling them on you notice your thighs are a little bit snugger than they used to be. ‘They must have shrunk in the wash’, you think. You zip them up and struggle at the last button. Twirling around (as you do when nobody is looking) you view from all angles the apparent new tightness, your sense of unease grows. ‘No worries’, you figure as you pull out your favourite shirt, ‘I have only worn it a few times and it is always a winner’ you reassure yourself. Buttoning it up, a feeling of fear and dread takes hold as you realise the shirt is also extremely tight. You are stunned and embarrassed all in one. Suddenly at that moment, like a bolt of lightning, you decide you must do something radical to reverse this trend. Monday can’t come quick enough to start your new healthy life. When we start a new exercise plan or a healthy diet, we are generally full of enthusiasm and vigour. The ‘trigger’ to start this new way of life can be very powerful and can be full of heart felt emotion. We may jump head first into all manner of crazy low calorie juice diets and ultra exercise plans. We punish ourselves for getting into the situation we found ourselves in the first place and believe the all or nothing game plan is the only method to bring success. After a week or two of hard graft, we may have fallen off the wagon somewhat, the juice diet is replaced by the normal pattern of eating and after missing a session or two of the extreme exercise, you decide to return to the safe haven of the couch. Feeling a sense of defeat, you console yourself with that piece of chocolate you have been depriving yourself and think that you gave a good shot anyway. Unfortunately without an actual long term plan many people will be doomed to failure every time they get determined to make a change. No matter how string our intent, will power is only so strong and we will eventually return to our normal ways. Without changing our habits we are just setting ourselves up for a fall. Becoming healthier, losing weight and getting fitter is a long term life project. It should not be a something we do for four weeks and expect to see amazing results. If you try to run a marathon by sprinting at the start, you might make great progress initially but it is unsustainable. You will burn yourself out and may have to pull out due to overexertion or injury. If you start slowly, you will make slower progress, but you will quickly gain confidence, the miles fly without too much effort as you reach towards your goal. You are far more likely to get to the end. What the hell does this mean in our lives? Gung ho approaches to our fitness and health can work for some but not for all. Most people work better with small, sustainable changes over a long period of time. Pick one aspect you want to target with your Diet, Exercise for this month. Pick something so simple, that it will be impossible for you to fail. This is crucial, people think that picking something easy is a waste of time but the confidence that you get from achieving something, no matter how small can be dramatic. When these positive changes add up over a period of time, this is where the magic happens. Get a diary and write down your two goals for the month. Work on them solely for the month and forget the rest. 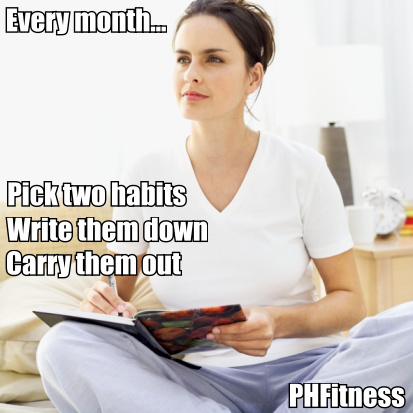 When you achieve them, pick something else for the next month but make sure you retain the first habits you tried to develop. Diet – Eat two different vegetables with dinner. Eat two/three pieces of fruit a day. Reduce alcohol to 10 units per week. Eat protein with breakfast. Drink 2/3 litres of water every day. Consume take away foods only once a fortnight. 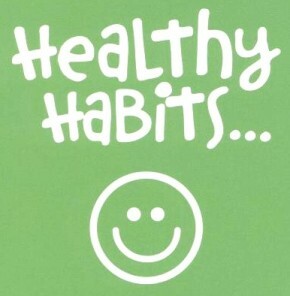 Eat ‘healthy food x’ instead of ‘unhealthy food y’. Will refuse all cakes and chocolate in work. Exercise – Walk for 30 minutes four/five days a week. Every Saturday morning, go for an hour cycle. Do a body weight circuit or a dumbbell workout twice/three times per week. Use the bike to go to work on a Monday and Friday instead of using the car. Use the stairs instead of the elevator whenever the opportunity arises. Get over 6000 steps every day on your pedometer. Now get a pen and paper and write down your monthly targets. You will be glad you started in a few months time.